Stephanie is participating in the undergraduate program offered by the University of Chester and majoring in Business Studies. The primary reason she wanted to study there was to one day attract the compensation related with attending a highly regarded educational institute. Gaining admission to prestigious college or university is frequently regarded as an accomplishment in itself, and many view obtaining a degree from a university in the United Kingdom as a gateway to a successful profession. To study abroad is not an easy decision to make, and Stephanie needed to consider all aspects, both positive and negative. The most common experiences encountered by international students are homesickness and culture shock. “Although I am independent and quite familiar with the culture in the United Kingdom, it was still really never easy for me, especially in terms of the language barrier”, she reports. Living away from your family and friends for the first time is a significant event in any person’s life. Therefore, it is important to consider the best accommodations available (within reason), since there will be more freedoms (and more responsibilities) that arise from living independently. However, studying abroad is not just about obtaining a degree, you must be sure to have fun as well! 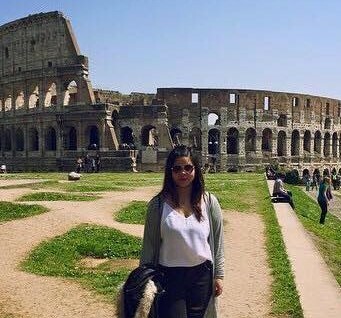 “Living abroad gave me the opportunity to explore not just the new country I’m living in, but also to get out of my comfort zone and explore other European countries. I studied in the United Kingdom, and I took the chance to visit other European countries such as Italy, Greece, and France. I shared photos and videos which served as my token of remembrance of my time abroad. I strongly recommend studying abroad as it will give you the opportunity to see the world. Inter-Ed had been very helpful in organizing my choice of studying overseas. They provided assistance from the start, up until I obtained my confirmation of acceptance of studies in the University of Chester in the United Kingdom. Inter-Ed provided me hands-on and up-to-date assistance from my application to the university, to the acceptance of my offer, to meeting specific conditions, application of student visa, organizing my accommodation, booking my flight- until the day of my departure.